'Learn, Respect, Celebrate' - and other trite, white, phrases. 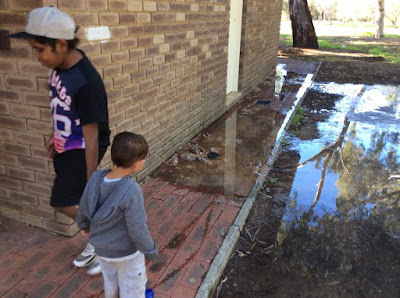 Image description: Children play in raw sewerage around a toilet block. There’s a running joke in the disability sector that goes something like this. Q: If the 3rd of December is International Day of People with a Disability, what happens on the other 364 days? I’m reminded each year on that day by the hypocrisy of the sector, who hold breakfast events to celebrate IDPwD despite most disabled people being unable to attend, who speak in glum terms about two percent employment rates and then do nothing to remedy it, who do things for us and to us but never with us, and consequently seldom get it right. But sometimes I see this happening in other sectors. That happened this week, and it hurt my heart.